Hold onto your hats, friends. Kyo Maclear and Esmé Shapiro are collaborating on a picture book and it. Is. Fantastic. If you're a fan of Frog and Toad, then this is definitely the book for you! 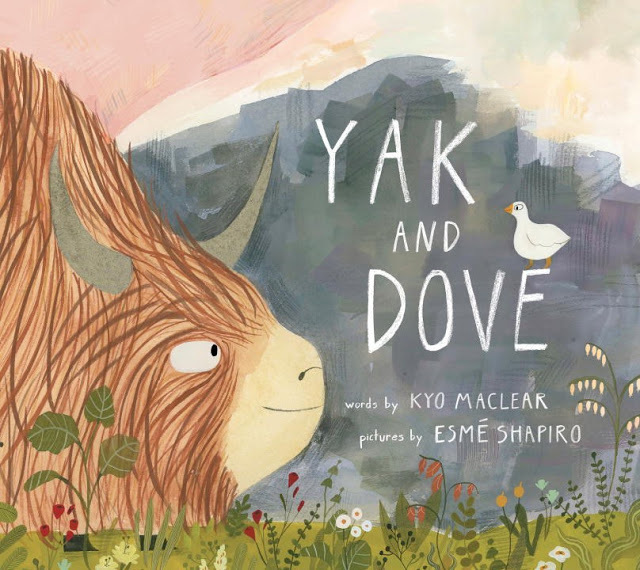 Yak and Dove are complete opposites: Yak is large and Dove is small; Yak has fur and Dove has feathers. Yak is polite and Dove is...not. But though they seem to have very little in common, it doesn't take long for the duo to realize just how important they are to each other. The book -- which is longer than the standard 32 pages -- is broken down into different "chapters" in which the duo explores the world around them, uncovering things about each other and learning what makes them such compatible friends. Readers are provided with a fascinating entry point into these stories. We enter the book while the two friends are in the middle of one of their adventures as though we, ourselves, are a casual observer to their fun. We see these two characters as they truly are because they have nothing to hide -- it's not as though the events we witness build up to some dramatic conclusion, these are just daily goings-on for the pair, and it's clear they have nothing to hide. The illustrations are watercolor, gouache, and colored pencil, and the text is hand-lettered so there's an extra feeling of intimacy. Shapiro even goes so far as to distinguish the speaker by giving Dove thinner text and Yak heavier text. It makes reading the book aloud extra fun. A sure-fire classic, Yak & Dove publishes from Tundra Books this September! Grab your best friend and find it the moment it does! Images excerpted from Yak and Dove by Kyo Maclear. Text copyright © 2017 by Kyo Maclear. Illustrations copyright © 2017 by Esmé Shapiro. Published by Tundra Books, a division of Penguin Random House Canada Limited. Reproduced by arrangement with the Publisher. All rights reserved.